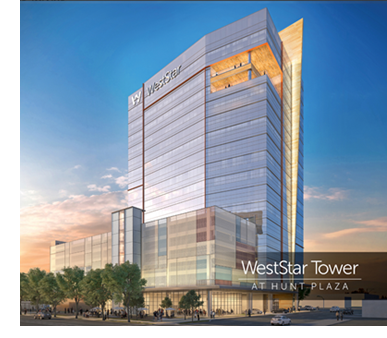 ​​ ​​EL PASO – Hunt Companies and WestStar Bank broke ground on the WestStar Tower at Hunt Plaza at 601 N. Mesa St. in downtown. The 18-story office tower will be the tallest building in the city at 306 ft and the first of its kind built downtown in nearly 40 years. It is expected to open summer 2020. Hunt Companies will move its headquarters to the tower, bringing about 175 employees. WestStar Bank plans to move out of its four downtown buildings and move about 260 employees to the tower. The development will include a community event space, park-like gathering areas, and outdoor seating, as well as café, dining, and retail space on the ground floor.